Systemic sclerosis (scleroderma; SSc) is a chronic con nective tissue disease characterized by inflammation within, and fibrosis of, the skin, vascular abnormalities, visceral damage, and the production of autoantibodies. SSc is divided generally into limited and diffuse forms, based on the extent of skin involvement. A group of conditions known as “localized” sclero-derma, which includes morphea, linear scleroderma, and en coup de sabre, is discussed in the chapter on Scleroderma Mimickers (Chap. 11). Diffuse SSc has a greater extent of skin involvement and is more likely to be associated with renal crisis, pulmonary fibrosis, and cardiomyopathy. Patients with diffuse SSc have a higher mortality rate. Pulmonary disease remains a major source of morbidity and mortality for patients with SSc. Patients with limited SSc are predisposed to the development of pulmonary arterial hypertension (PAH). Those with diffuse SSc are predisposed to interstitial fibrosis. Autoantibody profiles can predict to a certain extent the types of organ involvement that can be expected in SSc. Raynaud's phenomenon (RP) is characterized by vasospasm of the digital arteries that leads to well-demarcated pallor with cyanosis and rubor. RP is essentially universal among patients with SSc and is the first symptom in a large majority of patients. Primary RP is often mild enough not to require treatment; however, with secondary RP from SSc, there is not only vasospasm but also fixed blood vessel problems with luminal narrowing, so the ischemia can be more severe. Complications of RP in SSc can include digital ulcers often leading to infection and amputation causing pain and functional disability. 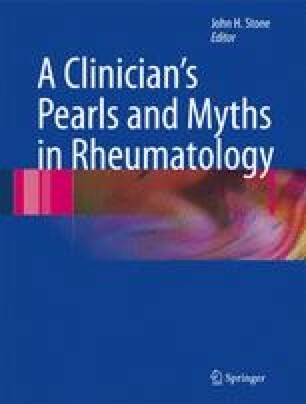 Diffuse SSc often presents with puffiness of the hands associated with pain, in a way that can mimic rheumatoid arthritis. RP often occurs around the time of development of puffy hands in diffuse SSc.